Locate the sound file on your computer. Drag the file onto a White Key on ARCADE’s keyboard. Note: You can also drag multiple sound files directly into ‘Loops You Added’ area in the Browser. ARCADE will analyze the tempo and key of any Loop you insert. Once the loops are dragged in the white keys, you’ll be able to review and edit the tempo, key and time signature to ensure your sound plays back at the correct settings. You can manually hover over the White Key that has been marked green and click ‘Review’ to open the Loop Edit Page. If they need any changes, double-click the BPM field to enter in your sound’s BPM. To set the key (for tonal sounds) click Key and select your sound’s key from the dropdown menu. Lastly, make sure to change the Time Sig to match that of your sound’s time signature. These settings can still be modified manually if you wish to make changes later on. The Loops You Added tab of the browser allows you to review and edit metadata for multiple Loops by selecting Edit Metadata from the right-click menu. That’s it! Once a User Loop is mapped into a key it can be further manipulated by Effects, Macros, and Modulation. You can see all of your User Loops by opening the Browser then clicking on Loops You Added on the left-hand side of the Browser. Note: On some Windows 10 systems running ProTools as an administrator won’t allow you to drag audio files from the desktop into the app or plugins. Run ProTools as a normal user to avoid this issue. Looking to add a full Kit’s worth of User Loops? You can now drag and drop multiple User Loops into ARCADE. Just select all of the Loops you wish to add into ARCADE then drag them right onto ARCADE’s keyboard in the interface, and the Loops will be added to the White Keys. Click on the down-arrow icon in the top of ARCADE’s window directly to the right of the current Kit’s name. Click New and answer the prompt on the pop-up which asks if you’d like to save any changes to the current Kit. Create the Kit the way you want it using either Factory Loops, User Loops, or a combination of both. You can also add your own selection of Modifiers and Macros. When you have the Kit the way you want it, click on the down-arrow icon next to the Kit name at the top of ARCADE’s window and select Save As. Click the Advanced button to show additional fields for metadata that can be stored, including Kit Key and individual Macro names. Make sure to input information in here to ensure your Kit runs smoothly within ARCADE. Done! To load a User Kit once you’ve saved it, open the Browse Mode and click the Kits You Saved button on the left-hand side. 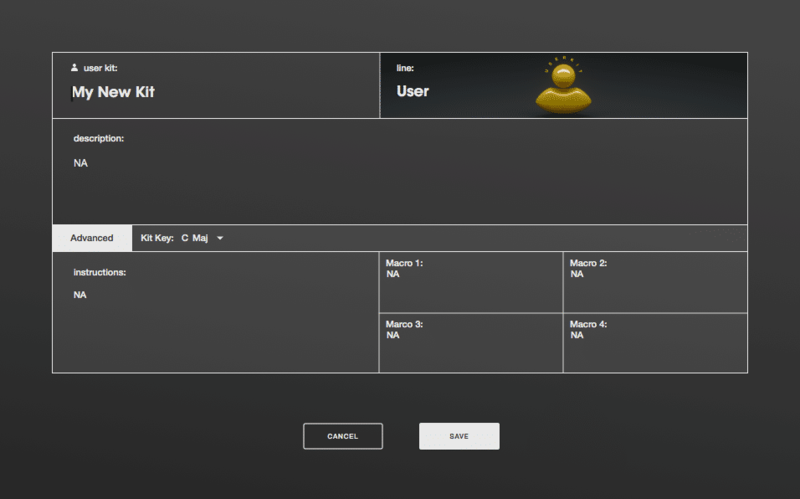 In here you’ll see all of your saved User Kits which can be loaded by clicking Load on the right.